Say what you will about the film itself, at least the score from Justice League is good. Returning to the DC universe for the first time since 1992's Batman Returns, Danny Elfman not only brings his original Batman theme with him, but John Williams' iconic Superman theme as well, creating a score steeped in the rich history of DC's past. There has been quite a bit of controversy over whether or not this was the right approach, given that the DC Extended Universe had already established a kind of thematic continuity through Hans Zimmer's work on Man of Steel and Batman vs. Superman: Dawn of Justice. Elfman does preserve Zimmer's Wonder Woman theme, which makes an appearance in "Wonder Woman Rescue," giving it a rhythmic variation that it never received in BvS or in Rupert Gregson-Williams' Wonder Woman. That is perhaps the greatest asset Elfman brings to the table in Justice League, his ability to intelligently develop thematic material in ways that the DCEU just hasn't done up to this point. As someone who was a fan of Zimmer's Man of Steel, it does seem a shame to completely abandon the bittersweet piano motif, but it's also hard to argue that Williams' Superman theme isn't far superior. These are iconic themes for iconic characters, and Elfman puts a dark spin on the Williams material that mutes its irrepressible optimism in a way that feels more appropriate for this new DC universe. Williams' theme makes a few brief appearances in "Friends and Foes" and again in "The Final Battle," each time mutated almost beyond recognition, yet still carrying that essential Superman DNA. 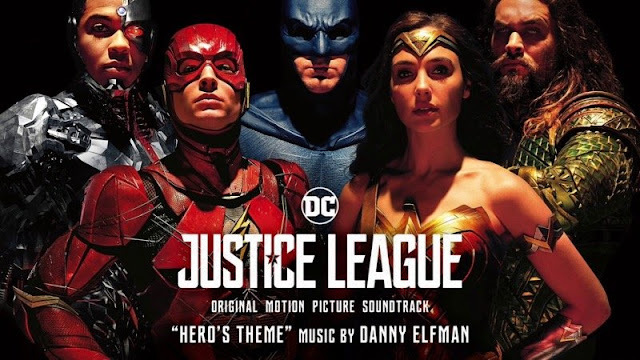 It's judiciously used, and Elfman wisely strips away its fanfare-like qualities in favor of a more brooding tone, at least until its final triumphant statement. The Batman theme is used a little more liberally, popping up prominently in "Batman on the Roof," "Then There Were Three," "The Tunnel Fight," and "The Final Battle." Elfman never really gives it a full treatment the way he did in Batman and Batman Returns, but this isn't just Batman's story, so he avoids allowing it to take over. The problem with this is that his new Justice League theme just isn't as strong as either of the classic themes he employs here. It's a serviceable theme, especially when deployed with the composer's signature choirs, but don't expect to walk out of the theater humming it. The same is true for the rather anonymous motifs for Cyborg, Aquaman, and the Flash, which don't really establish themselves strongly alongside more memorable material for Batman, Superman, and Wonder Woman. Hopefully they will have a chance to become more fleshed out in their own respective films. Still, it's good to see Elfman in this mode again, with a grand, heroic canvas on which to paint. "The Tunnel Fight" and "The Final Battle" are action powerhouses, especially in their full, extended forms that are included as bonus tracks. There will certainly be those who argue that the DC "sound" established by Hans Zimmer and Junkie XL is a better fit for this universe than Elfman's work, but his action writing is just so intelligent, and the thematic variations are much stronger than anything we've seen in the DCEU thus far. It's hard not to feel the hair on the back of your neck standing up when the original Batman and Superman themes come bursting out in their full glory. This isn't mere fan service or nostalgia pandering, it's a return to a more classic sound that brings some of the most iconic superhero themes of all time back into the fold. It may dispense with the established DCEU sound, but I would argue that it captures the comic book spirit of the source material, as well as Joss Whedon's lighter style, with greater flexibility and thematic integrity, than anything the series has seen before. By looking to its past, Elfman offers a more engaging path forward for the series that is rooted in its classic history, but charting a bold new path forward. Now available on streaming platforms and digital download. Available on CD Dec. 8.